Emil Guillermo: A new divided America after the midterm elections, but Trump? Still the same. On the day after one of the biggest turnouts ever for a U.S. midterm election, the president of the United States won’t let reality spoil his view of life through Trump-colored glasses. 2018 midterms? Why, they were a “tremendous success,” according to a succinct Trump tweet. But then he gave a news conference to let people know how he really feels. That’s even though exit polls showed these midterm elections really were a referendum on Trump himself and his reckless style of blunt governance. Whatever attracted voters to Trump in 2016 was rejected in the very states that gave Trump his presidential margin of victory, including Pennsylvania, Michigan, and Wisconsin. Those voters led an anti-Trump switch back to the Democrats throughout the nation on Tuesday. In a resounding rebuke of anti-immigrant, hot rhetoric, a record number of voters returned Democrats to power in the House of Representatives, flipping the required 23 Republican-held seats, and adding perhaps as many as a dozen more as post-election counting continued. It also saw that the anti-diversity tone of the president was not a winning strategy. The first two Muslim women and the first two Native American women won seats in the House. But the message was mixed. While voters voted to make House Democrats a check on Republican power, they also gave Republicans an even wider majority in the Senate. Still, voters, in their wisdom, put an end to one-party rule. That would be a fairly objective assessment. America stays divided, but in a new way, where neither the president nor the Republicans can avoid the oversight scrutiny from powerless Democrats, as they did in the first two years of the Trump presidency. At his news conference on Wednesday, Trump was hardly holding out an olive branch. He seemed to be ready to swing a blunt stick at any threat, especially while standing before the media. And through it all, of course, Trump continued to insist what a good night he had. And then, he implied the way things worked actually could be good for deal-making. But will the temperature be lowered in the name of bipartisan progress? 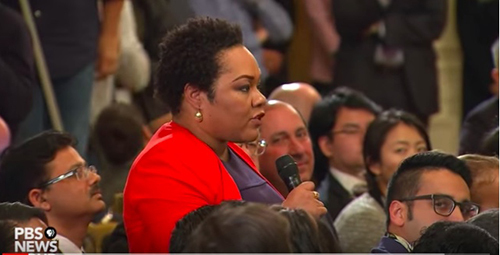 The president was rude and interrupted the PBS reporter, calling it a racist question. But maybe he was upset that he had to come up with a real answer to the very fair question. Trump punted and started talking about his poll numbers with African Americans. “The highest,” he said. Still, he couldn’t get over the initial question. Sounded fair to me. The reporter didn’t imply he was racist. But Trump saw an opportunity to dodge. He attacked the media and made himself into a victim. Oh, and mention that he wasn’t a racist. Another reporter asked the president whether he’d change his tone after the election. The reporter asked if he was serious about bipartisanship, especially after the divisive anti-immigrant tone he used in the final weeks of the campaign. Would we see a softer Trump? That’s how the president sees it. He still hates the media. And he apparently didn’t learn much after a night that finds him staring at a House of Representatives with subpoena power that it is sure to use judiciously as a watchdog to power. But it almost guarantees Trump is ready for a fight against all comers in the coming year, and into 2020. Trump seemed ready to go to war. And then almost like clockwork, he ended the press conference and carried on, like the midterms never happened. Right after the press conference, the announcement came out that his attorney general whipping boy, Jeff Sessions, was fired. Asked to resign. Gone. With the House no longer rolling over like Devin Nunes, Sessions’ future was a foregone conclusion. Sen. Mazie Hirono issued a statement to connect the dots. Not surprisingly, Whitaker has publicly espoused Trump’s “witch hunt,” belief, which probably means he should recuse himself before he becomes Mueller’s boss. Trump’s action does set the agenda almost immediately. He sure isn’t acting like someone with nothing to hide. Bipartisan legislation to protect the Special Counsel’s investigation of Trump will be needed pronto. And we’ll have to make sure that a permanent attorney general will be independent in order to safeguard the rights of every American, from immigrant rights to voting rights. It sure didn’t take long to feel the harsher realities of the end of one party rule. Expect the partisan divide to worsen. Then again, that’s what Tuesday was about. Voters empowered Democrats in the House to ensure Trump doesn’t trample our democracy or think he’s above the law.